The story is based on Finno-Ugric culture. You play as the Mooseman and must traverse from the Lower World, to the Middle World, and finally the Upper World where the ancient gods reside. 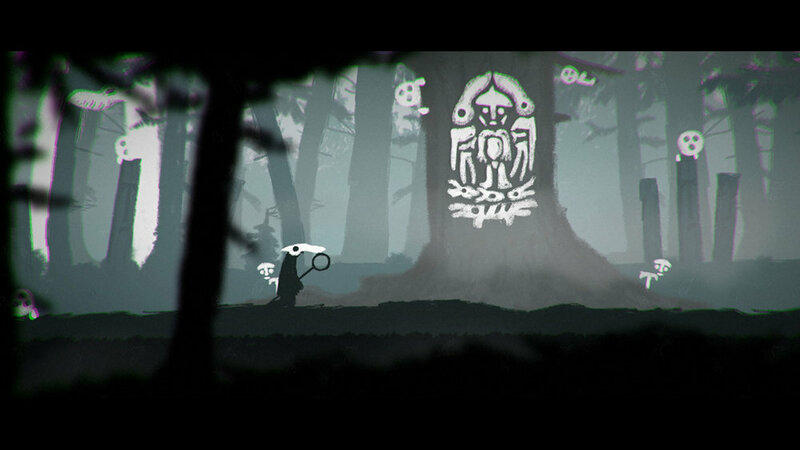 Progression is possible thanks to the Mooseman’s ability to see hidden spirits and objects. Hitting one button changes the game’s visuals such as a rock turning into a moveable spirit, allowing players to place platforms and cross chasms. While the player only moves left and right, the visuals cover the foreground, middle ground, and background in unique ways. The beginning forest area and swamp look generic and feel almost too basic in terms of gameplay. However, once I reached the cave my opinion began to change as the game created an engaging sense of atmospheric immersion. The sound of water droplets, the eye-catching drawings, and different lighting arrangements paired with shadows combine into a feast for the senses. Throughout the game, players collect optional artifacts and read myths that shed more light on the story. While some are hidden, others are presented to the player. Learning more about the culture is interesting and kept me looking forward to what would happen next, but constant myths and artifacts disrupt the flow of the game. Obtaining a new one means pausing the game and navigating counterintuitive menus to read about it. Although minor, there’s no quick way out of menus. You have to manually select back on every one and then hit continue to resume playing. Immersion is important to this genre. The Mooseman’s stop and go nature ruins the immersion and at times makes the experience tedious. Pausing to read more is similar to turning the page on a big picture book and occasionally made me wonder if the game would have been better off in a different medium. There’s also the issue of telling the player about the mythology instead of showing them. The myths could have been integrated more seamlessly and frequently into the gameplay. For instance, when I walked past the guardian of the Underworld, I had to stop and read a description instead of learning it through gameplay. The game may have benefited from more narration like the ones between sections. Additional dialogue would keep players in the action while still teaching them about the culture. Despite my desire for more challenging puzzles, variation and quick progression provide players with constant satisfaction. Over the course of a roughly two-hour journey, players will hit switches, match shapes, ride a bird, and fire a bow and arrow. Auto walking comes in handy and is never risky due to the game’s convenient checkpoint system. There’s no penalty for dying. Even if you collect an artifact and die before reaching another checkpoint, you’ll still have it. Reaching new sections is somewhat jarring because the game abruptly stops after a few seconds between new areas and narration. Personal favorite areas include the snow, wind, and starry backdrops. Things like walking on snow sound exactly like they should. The music on the other hand is at its best when minimalistic. Finding hidden artifacts sometimes requires more challenging routes involving multiple enemies, making the acquisition of knowledge feel even more rewarding. Spirits are both friendly and hostile. Realizing some of the “harmless” background spirits actually attack and instantly kill you adds to the experience. While there aren’t many enemies in the game, their sequences make for some of the most memorable moments. The sad whimpering wolves, a morbid feeding sequence, and just making sure you aren’t seeing spirits in the wrong place at the wrong time are some of the standouts. There are a few encounters that can be called “bosses” featuring indirect “fights.” Ominous shadows or creatures appear in the foreground or background a few segments before they confront the player. I won’t spoil these but the river and Upper World fights make clever use of the gameplay elements in ways that I wish were further expanded on elsewhere. The player largely remains the same throughout the game except for one mandatory power that shields them from harm. As an atmospheric game, your enjoyment of The Mooseman will greatly depend on your level of immersion. Do the graphics click with you, is the mythology compelling enough to learn more, and does this sound how you think it should? While it provides a pleasant experience that can be completed in one or two sessions, the large amount of text and lack of memorable sequences prevent The Mooseman from being something great. However, it excels in establishing a strong atmosphere, which was one of the game’s primary goals.